It’s been a while since our last devblog as we’ve been a bit overwhelmed with the V2 release, our systems haven’t been under this much pressure from player numbers for a while and it’s exposed some bugs and performance issues we weren’t totally aware of. We’ve been working our way through these issues as our highest priority, we’ve already made several improvements and fixed bugs and we’ve got more fixes on the way to roll out soon. With our servers getting smashed performance has become a major issue and the area we’ve been working on the most post-release. Whilst Spencer has been busy making huge improvements to our networking library in terms of memory allocations I was altering it to decouple the socket read/send operations from Hurtworld’s main thread. My implementation seemed ok in testing but after rolling it out we discovered it had made us more vulnerable to DDoS attacks so we rolled this change back for the time being however I’m working on a more robust implementation now and hope to have socket operations back off the main thread soon. In more successful performance improvements I’ve also massively improved how meteors and air drop cargo planes are synced. Previously these were sending position and rotation updates every couple of ticks when in reality their movement was deterministic as long as starting position and rotation matched on client and server so I refactored these to just need a setup message rather than several updates per second to all players. I’ve also been improving performance of world item generation (whenever an item exits an inventory and enters the world like dropping it from a backpack) by taking our item renderer components from a prewarmed pool rather than creating them on the fly. This helps with both cpu time and memory allocation however our world item generation is still a bit overly complex and there are more wins to be had here, I’ll be making more improvements here soon hopefully. I’ve also been working on a bunch of bugfixes including improvised bows not being recolorable, Mozzy chassis not being recolorable or maskable, fixing options resetting to default and fixing always getting denies for hits against Mozzy passengers. In terms of upcoming stuff in the next patch I’ve added an inverted pitch toggle option for helicopter controls, fixed up the in game changelog not displaying properly, attached owrongs and bandages properly to the hand bone of the player skeleton and added proper handling for an error that could occur during shutdown that would stop a server restarting normally. I’ve also got an entity update timing change which should smooth out low performance situations much better leading to less ‘dropped’ update frames. We will be wiping all official servers Friday 1st Feb (Today) @ 7pm AEDT. At the same time we’ll also be releasing another small update with bugfixes, improvements and other small changes that will require community servers to wipe when they update to it. We’ll be merging some of the low population servers and keeping an eye on the situation, spinning up fresh servers where we see demand. These servers will run a 14 day wipe cycle after which we’ll be releasing a proper content update (0.7.1.0). After 0.7.1.0 hits we plan to do content updates either on a 4 or 6 week cycle (not 100% sure yet) which will line up nicely with 14 day wipes, on non-content update wipes we plan to make balance changes and other small tweaks to shake it up a bit for the next cycle. We’re still listening and evaluating demand for other wipe cycles but there are advantages to us being consistent with wipe cycles across official servers (easier to balance for instance). As the other guys have mentioned there’s a bunch of stuff backed up from the last Dev Blog, so here it is in one big flood. The Pickaxe; This took a little longer than expected as I went down a path of trying to make a modular pickaxe that had 1 of it’s diggy bits get swapped out with each tier of pick. I ended up hating this after I realised that if 1 side only changed it made no sense. You would have an iron pick tip on the other side that never changes. 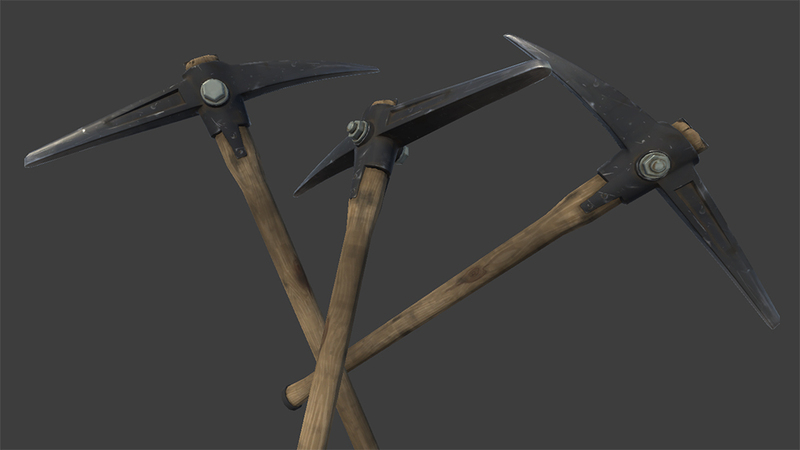 We would have to make entirely new tips on both sides and ended up deciding to just make individual cool new Pickaxes down the line. 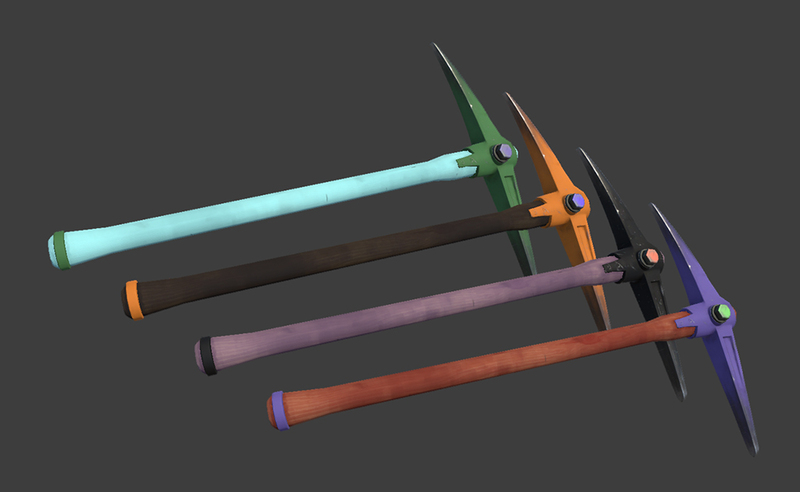 For now the Pickaxe works pretty much like the old one but just looks better and matches up with the other redone tools. Here’s the concept of the initial idea that I ended up hating. Lastly some nice examples of what colours players may choose. This has been irking me for a while. I like the model but the textures and details just weren’t there because of the shift in style. 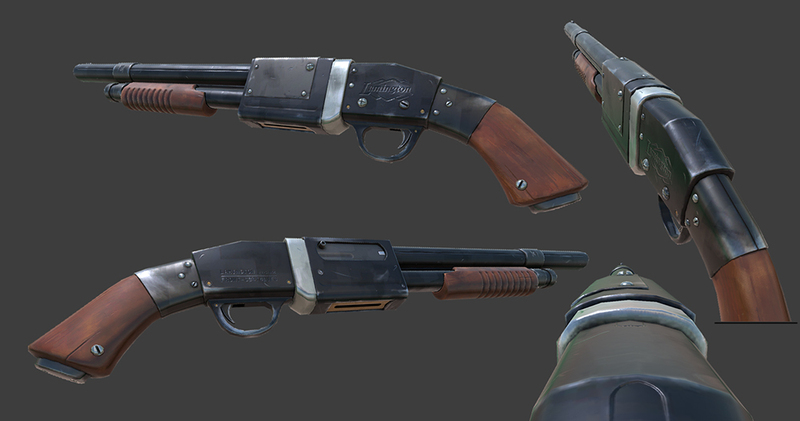 This now looks really nice and I feel it will make you actually want to use the shotgun again and enjoy owning one. Also this is the first thing I made after the release of V2. We decided it would be good to be able to store your resource blocks somewhere. Right now the only safe place to store them is on the back of the slug, the blast furnace, which is strange and equipped on your player in your heavy slot to the right of your hotbar. 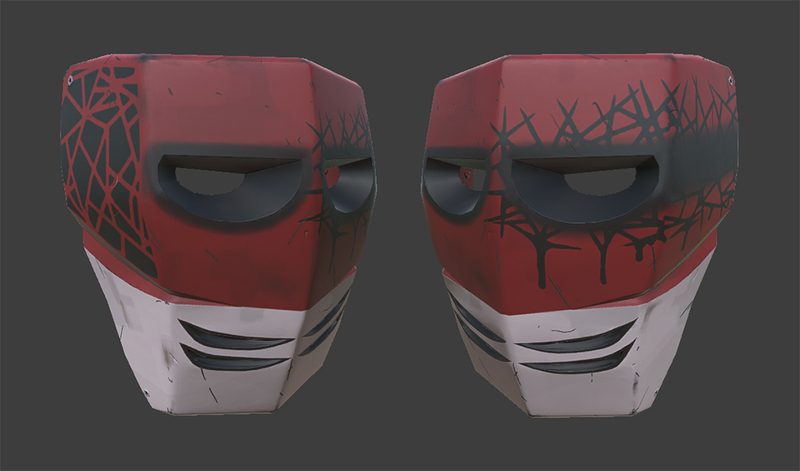 I also made this mask called ‘Shogun’ I’ll be adding a few new masks this week to give the players more customising options. So, lots of stuff has been done leading up to release but you guys have probably seen it all by now so I’ll skim over it, got the map into the best state it’s been in, one of the main things was fixing 99% of the steepness problems around the map, I took all the main hill stamps we use in game and smoothed them out and gave them each a couple interesting features, like flat spots for building bases on. I then spent some time making Kanga jump puzzles that have been placed around the map that give out jump medals when you complete them. 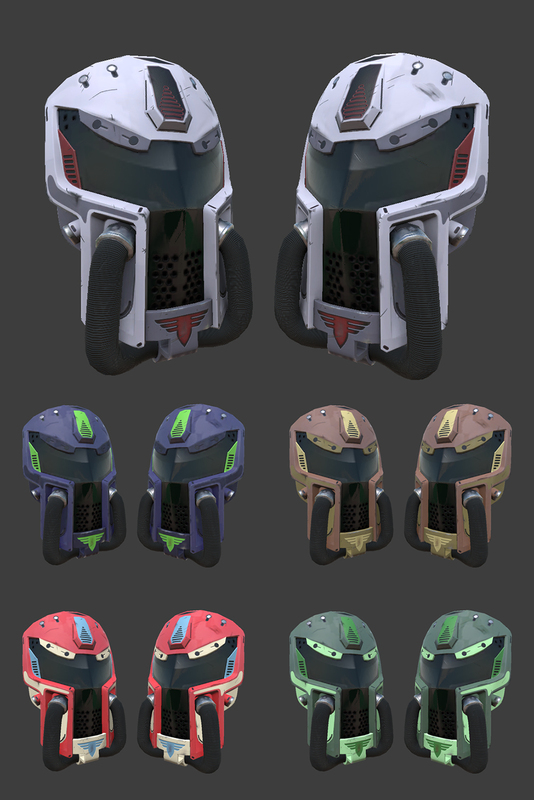 I’m now making some new gear in a way that I originally wanted to do it when I made the military pants and helmet, I wanted to make sets of themed gear but we just didn’t really have time or a huge need for it, but now that V2 has been released it’s a good time to do some pure art stuff and stay out of the way of the programmers. The last couple weeks have been flat out keeping everything running in the wake of the massive player number spike. Now that that servers aren’t crashing much anymore I’m focusing on fixing the constant rewinds that happen every 20 seconds or so. We should have a fix for this within the week along with a bunch of other critical bugs and will be able to start moving on to new content. The time is finally upon us. Hurtworld V2 update goes live on our main branch on Saturday the 12th of January. Those of you who haven’t been keeping up with our progress, Hurtworld V2 is a massive update 2 years in the making, free to all existing owners. We’ve been refining the gameplay mechanics in a separate branch, to keep the core experience stable and to give us room to push the boundaries of the survival genre. We tried a bunch of stuff, learnt lots from the things that didn’t work & found a bunch of things that we think elevate the game without compromising the core experience. More recently we’ve been working with the community to ensure these big updates stay true to the roots of what worked so well in our Early Access launch. It’s been a long road & now we’re super excited to share Hurtworld V2 with the world! We rebuilt our character and equipment systems from the ground up allowing players to fully modify their appearence through character customization. Fly the colors of your clan with every weapon and piece of clothing now fully paintable. Name your items that will persist long after your enemies have stolen them. We’ve doubled down on PVP gunplay by rebuilding the ballistics system from scratch to include a detailed recoil model and server verified bullet projection. We then redesigned all our weapons to be completely modular with upgradable sights, stocks, attachments and other stat modifiers making no two weapons the same. Beyond weapon customization, we took a deep look at how PVP should flow, spending countless hours refining respawn mechanics, death punishment and player loot to replace the controversial infamy system from legacy. Vehicles have always been at the heart of Hurtworlds progression which we’ve extended to include a truck capable of carrying high value “heavy slot” items, as well as a punishing to fly but rewarding multiseat helicopter. 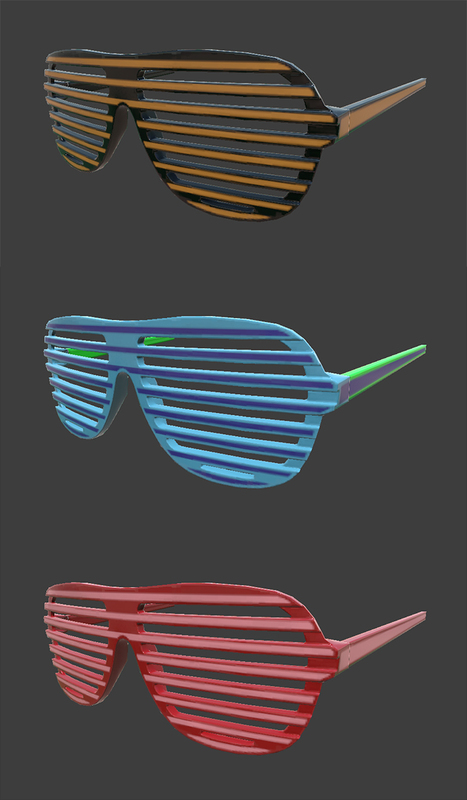 Like always you can customize these to your hearts content. Server performance upgrades have allowed us to expand the max players per server greatly and to support this we built a new map from the ground up to support the increased server population. Nullius expands into new biomes, a new layout and adds lots of new towns to be contested. While maintaining the existing gradual town loot, we’ve added random town events with large rewards to insight more meaningful PVP conflicts for those who want to jump in. Throughout the world you’ll find rich meteor showers, air drops and rare creatures that will constantly keep you on your toes. Clans can now be made official, allowing tracking of clan mates on the map, clan driven ownership of bases and server rankings. Literally make your mark on the map by competing with other clans for control over territory in special areas that crank PVP and raiding up to 11. On January 12th Hurtworld V2 will become the default launch option in Steam. For those who love Hurtworld the way it is, the legacy branch will remain accessible through a Steam launch option. The finished touches are on the Mozzy ready for the next release! This week I’ve moved on to an optimisation and stability pass on V2 in the leadup to the official V2 launch coming very soon. My goal is to ensure that V2 is a performance boost from V1 for all players before we release it. I don’t think we are far off from that. Our main regressions are an increase in town rocks, terrain texture counts and poor town event optimisation. I’ve spent a lot of time working on a utility for MadMaps that managed the consolidation of terrain textures and grass details. Mad Maps is our in house level editing tool, available free in our map SDK and available on the Unity Asset Store for third parties. As our map is made up of over 250 stamp assets it has become a pain to manage linking up every asset using the same output texture and grass definition. Too many of these end up adding draw calls to the Unity terrain renderer that can be costly on low end systems. We previously had about 19 textures being written to the terrain requiring 5 separate draw passes (4 per pass), we hope to consolidate that number to 8 ideally which should speed up minimum performance greatly. I’ve also been working on ensuring our network infrastructure is as solid as possible in preparation for the influx of players after the release. There are still some niggling issues that came out of the structure manager load balancing updates that possibly cause structures to not load properly that I want to get sorted. The Mozzy patch will be launching early Jan, I will announce an exact date after the new year. 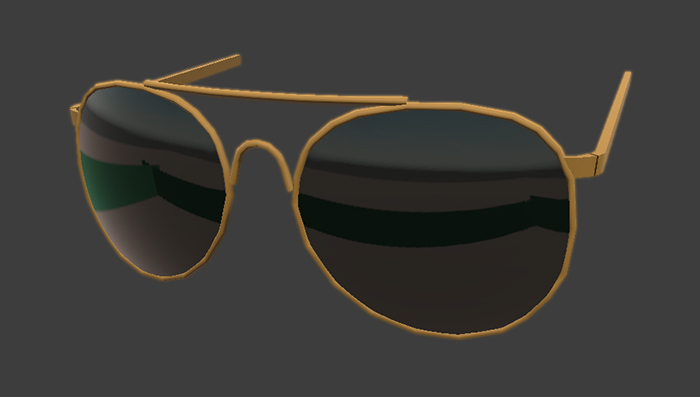 I got stuck right into the old models that you see quite early in the game this week. 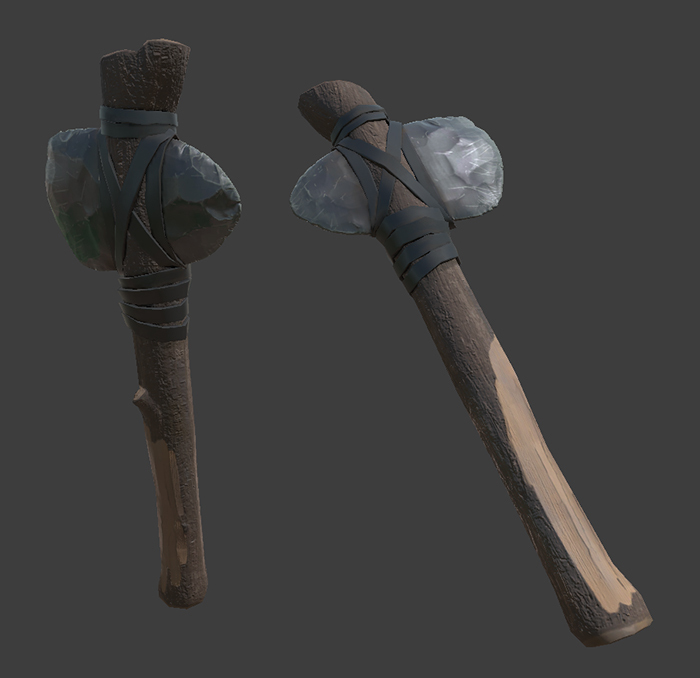 Firstly the Stone Hatchet which was looking like it was out of the pre-v1 alpha (and probably was) This bad boy was fairly quick to redo. Having my custom materials is great because where things can be reused I do reuse them and when I want something fresh or a bit different I have a good base to build from. Using existing materials I can then assume that they convey the same reflection and gloss values that have previously worked for that kind of material. The Stone Hatchet pretty much used materials I have used before so was super quick to get this one ready. 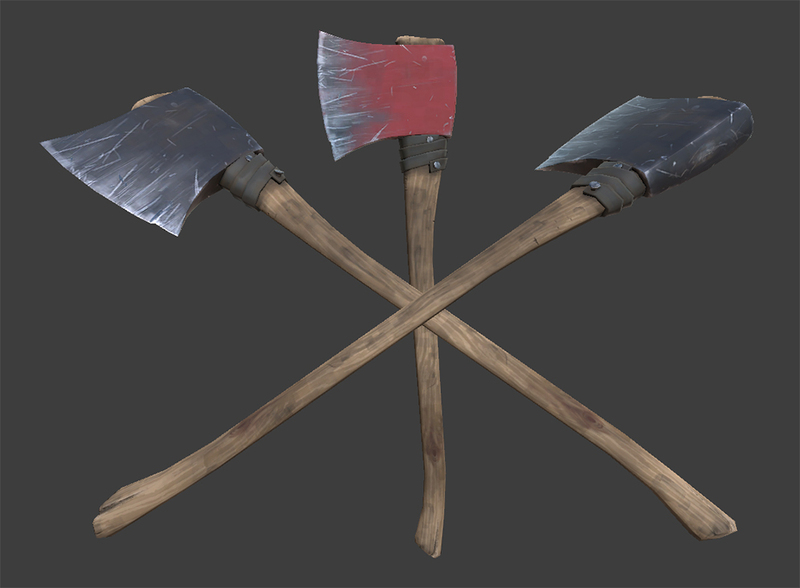 Next up was the redo of the Axe, this one also used materials I have used before with exception to the wooden handle. I wanted a more wood grain stripey wood for this one with a very matte untreated look. This came out really nice and the RGB mask we will use to colour the higher tier axes looks nice too. Since 0.6.5.0 release I’ve been scrambling to fix all the problems for the follow up 0.6.5.1 patch. Between disappearing vehicles and some overly generous weapon drop rates in towns we figured rather than pushing a hotfix ASAP we would spend a little more time tweaking the balance numbers and delay 0.6.5.1 until Thursday the 19th of December where we will wipe the servers again to bring everyone back to a sane baseline and be able to test the new loot balance properly. I’ve fixed the disappearing vehicles (sorry about this one, bad slip up on my part) and also rebalanced the vehicle distribution somewhat. Whilst all vehicle types were spawning properly inside the ‘Servo Wars’ towns the randomly scattered chassis spawns around the map weren’t spawning Goats leading to an imbalance in the opposite direction to what was intended (Goats should be easier to attain than the other vehicles). In 0.6.5.1 Goat spawns both in and out of towns have had their probability bumped up above the other two vehicle types and this is also reflected in the loot crates dropped in the vehicle towns. I’ve also toned down the drop rate for vehicle masks and removed the vehicle protection fragment from the fragment loot trees. Map markers for vehicles have also been fixed so owned vehicles should always appear on the map as long as you are within 500 meters of it (before this fix the vehicle would have to move with the owner in range for it to display). I’ve also rebalanced the military town loot as we were a little overly generous with the guns that were dropping. Whilst the chance of having a gun drop is staying more or less the same we’ve changed the drop rates between the different types. Now you’ll be be much more likely to find a pistol than anything else and both the AR15 and AWM have been significantly reduced so they’ll be rare drops. Weapon attachment drops have had the same changes made (pistol attachments are common, AR15/AWM are rare). We didn’t want to totally remove the powerful weapon drops, aside from them being an exciting item to get we think their power is mitigated especially in the early game by players not being able to afford to protect them (so it will drop if you can get the kill) as well as not being able to craft any ammo and having to rely on looting it instead. This week I’ve been carrying on with helping out with the optimisation pass, I had to go through the Outpost town event stamp and replace a ton of stuff with the crates I made. 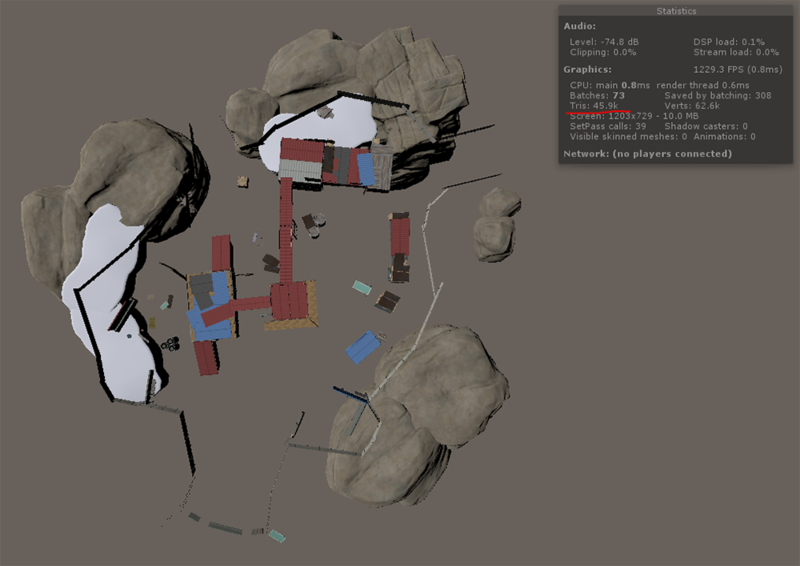 All these town events are built using basic Unity primitives at first to map out different lines of sight and make changing areas an easy task. When it comes time to polish these events all those basic primitives need to be replaced, unfortunately, during early stages of making these events we didn’t really have any good assets for filling out spaces so without thinking, I kind of just jammed a ton of small assets together and ended up blowing out the poly count by way too much, especially for such a small event. Those crates I made are very low poly and fill in a good chunk of space, not to mention they have been correctly sized to the player to make designing cover easier. Managed to shave the poly count of the Outpost by almost 50%, so that’s good. Also getting ready to start running every prefab used in the town events through simplygon so we can start loding them to really help with performance. Reorganised all the splats and details in the project, had a few hiccups with that, cut down heaps of duplicates. Currently re-stamping everything and trying to work through a couple problems.